DALLAS – July 6, 2018 – A DNA-sensing enzyme forms droplets that act as tiny bioreactors creating molecules to stimulate innate immunity – the body's first response to infection, UT Southwestern researchers report. The work, reported today in the journal Science, could lead to novel treatments for infections, autoimmune disease, and cancer. 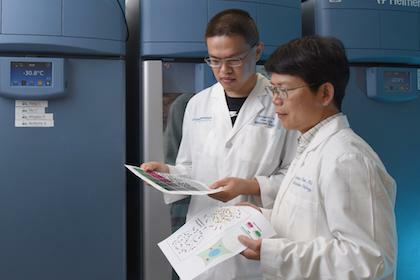 A hallmark of all three of those illnesses is the presence of DNA – either foreign or self – in the cell's gel-like interior known as the cytoplasm, said Dr. Zhijian "James" Chen, Professor of Molecular Biology at UT Southwestern, a Howard Hughes Medical Institute Investigator, and senior author of the study. The study's lead author is graduate student Mingjian Du. In 2012, Dr. Chen's laboratory discovered the enzyme cyclic GMP-AMP synthase (cGAS), which acts as a sensor in a cellular alarm system for innate immunity. The body has two immune systems. The first is an inborn, or innate, immune system that guards the body against threats it first encounters. The second is the adaptive immune system that deploys specialized immune cells to eradicate pathogens. The innate immunity sensor cGAS sounds the alarm when it encounters DNA – either from pathogens or from the body's own cells in the case of autoimmune disease – in areas of the cell where that genetic material should not be. Dr. Chen also identified the small molecule cGAMP, which is produced by the enzyme cGAS and functions as a secondary messenger that triggers innate immune responses. The current study finds that when cGAS encounters pathogenic DNA, it binds with the DNA to create droplet-size, microreactors that hold together despite the lack of a membrane. The study identifies the mechanism that holds the droplets together as liquid phase separation, which is similar to the way oil separates from vinegar after a bottle of salad dressing is shaken. "The droplets act as microreactors to speed up reactions that churn out the small molecule cGAMP, which activates the immune system," Dr. Chen said. "With a detailed understanding of the pathway, it will be possible to develop and design a variety of drugs for cancer and other diseases," said Dr. Chen, Director of the Center for Inflammation Research and a member in the Center for the Genetics of Host Defense who holds the George L. MacGregor Distinguished Chair in Biomedical Science. "Several companies are working on potential treatments now. For autoimmune diseases such as lupus – in which cGAS is aberrantly turned on by self-DNA in the cell's interior – the goal is to find cGAS inhibitors. With infections, it would be good to enhance the body's immune defense. There is also the hope of finding drugs that stimulate the cGAS pathway to boost the effects of cancer immunotherapy." In the study, Du and Chen found a threshold effect in the cGAS system. In test-tube studies they found that although DNA and cGAS are both needed to kick off the formation of membraneless droplets, a tiny amount of either DNA or the enzyme fails to sound the alarm. When the levels of both DNA and cGAS reach a threshold, the liquid droplets form and the pathway kicks into gear. This threshold response allows cGAS to tolerate low levels of self-DNA that may come into contact with the enzyme inside the cells but to trigger a rigorous response when the DNA reaches a threshold level, such as in the case of viral infections, he said. This mechanism ensures that the immune system can fight infections without causing autoimmune reactions in healthy individuals. However, in some individuals who have elevated levels of self-DNA that come into contact with cGAS in their cells, autoimmune diseases can occur, Dr. Chen added. "We previously studied a mouse model of autoimmune disease. In an experiment in which we could remove 50 percent of the cGAS enzyme, we found that doing so completely cured the disease in mice. Previously, that finding was difficult to explain. Now, this new model of a threshold effect for cGAS-DNA phase separation explains the finding," Dr. Chen said. The study received support from the Lupus Research Alliance, the Cancer Prevention and Research Institute of Texas (CPRIT), The Welch Foundation, and the HHMI.